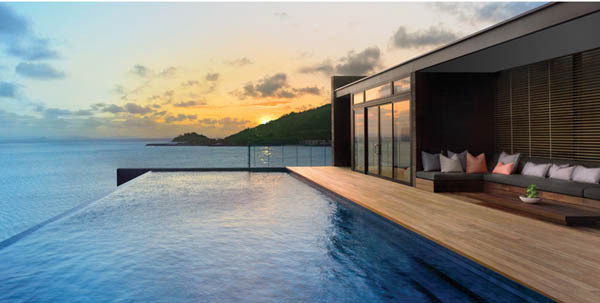 Located in the heart of Australia’s Great Barrier Reef, One&Only Hayman Island is the northernmost of the Whitsunday Islands off the coast of Queensland. Within this private island resort, stylish elegance reflects the harmony of nature with beautifully appointed accommodation set against the backdrop of the Coral Sea. Forming part of the Whitsundays, so named by Captain James Cook in 1770, One&Only Hayman Island offers a front-row seat to the Great Barrier Reef and a world of leisure and adventure. The Whitsundays have long been internationally recognized as one of the world’s most beautiful stretches of tropical coastline in the world. The 74 islands – 66 of which are uninhabited – dot the calm waters of the Coral Sea, sheltered from the Pacific Ocean by the Great Barrier Reef. Innovative cuisine in a variety of restaurants present a range of culinary experiences and the Great Barrier Reef provides the perfect setting for exciting activities including diving, snorkeling, fishing, sailing, kayaking, waterskiing and helicopter and seaplane adventures. Relax in the tranquility of the One&Only Spa, get active in the state-of-the-art fitness center, play a game of tennis or practice your golf swing on the driving range.